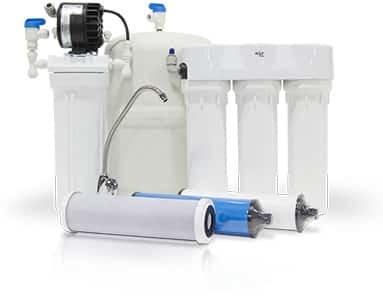 Simple reverse osmosis purification systems for city and well water. Free your drinking water from impurities. The reverse osmosis system purifies your drinking water right from the faucet. This initial stage filters out larger particles such as silt, rust and scale. This allows the membrane to tackle the smaller contaminants. Microscopic pores allow pure water molecules – hydrogen and oxygen – to pass through the membrane filter. All other particles are flushed into the drain’s water stream and exit the system. Water is routed to the holding tank. When you turn on the faucet, the water runs through a final carbon filter to remove any remaining tastes and odors before reaching your glass. Taste PureChoice water for yourself. Visit an Aqua Systems store and take home a water sample for free. The precision-engineered manifold creates a clean, well-organized reverse osmosis system that is easy to maintain. No messy tubes, no complicated hookups. The high-performance thin film composite membrane purifies city water and well water at the molecular level. With the Aqua Systems modular design, every part is removable and replaceable. Maintenance is easy, and you’ll never need to replace the whole drinking water system.